I was hesitant to enter this web site because of its name, and its vast catalog or digitally printed reproductions of famous paintings on canvas (Klimt’s Kiss, anyone??) . The site is a little dizzying, but I went straight to the section called ‘limited editions’ to see what might rise from the crop there. 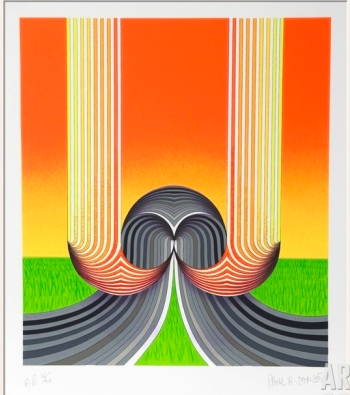 I was excited to find this amazing serigraph (also referred to as silkscreen print) by artist Paul Jansen. I was drawn to it for it’s 70s/mod, psychedelic style, but upon further research I found out that this artist had an amazing career and had been the resident artist at Jimi Hendrix’s Electric Lady Recording Studios in Greenwich, NY. He passed away not too long ago, in 2008. You can read more about him in this article (obit) here. Definitely a worthy investment, especially for a printophile like myself (who happens to have been born in 1977). This is fate!